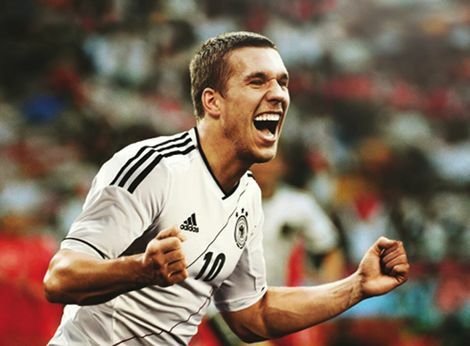 Long-time F50 man Lukas Podolski was rewarded for his loyalty by adidas with a very special bespoke pair of his favourite football boots for last night Euro 2012 clash with Denmark. 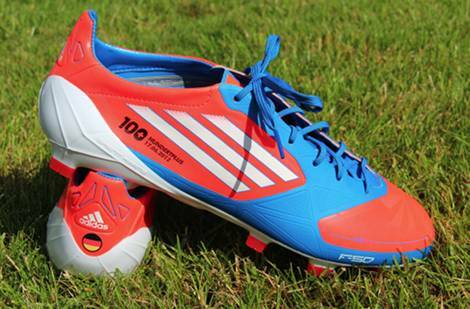 The German forward enjoyed a record-breaking night, as be became the youngest ever European player to rack up 100 caps for his country, a feat marked by sponsors adidas with this unique pair of the Euro 2012 edition adiZeros. 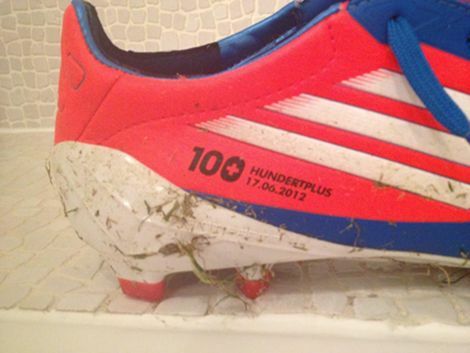 Emblazoned with the moniker ‘Hundertplus’ Podolski’s cleats mark the 100 caps earned, and the ‘plus’ in anticipation of the ones he’s sure to earn in the future, as he hopes to break Gerd Müller’s record of 150 appearances for Die Mannschaft. Podolski’s Match-Worn Pair – can you spot any more differences? As we can see from this wonderful up-close look at the Arsenal-bound attacker’s cleats, Podolski doesn’t have too many luxury comforts that many professional players have afforded to their footwear. 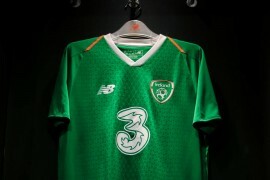 The former FC Köln man seems to prefer the lighter synthetic version of adidas’ game-changing F50’s, whilst the FG soleplate is likely a testament to the quality of pitches in the Euro 2012 tournament, in spite of some inclement weather. If there is one inconsistency between the ‘display’ model and the photo of the actual, match-worn pair, it would be that Podolski seems to have an additional layer of black material in the heel, presumably to help guard against blisters when he doesn’t have time to break them in. We imagine that the 27-year old attacker will cherish these boots for a long time to come, not least as he scored the opener of the night in his bespoke footwear as Germany ensured a perfect record in the group stages by beating Denmark 2-1.